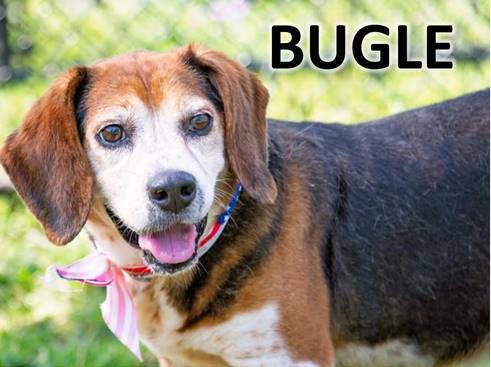 Bugle is a sweet and friendly older gentleman who enjoys long leisurely walks, anything food related, and the comfy spot on the couch. 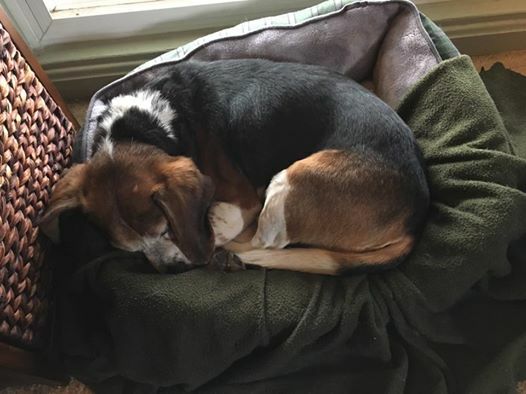 He is very quiet and rarely barks, although he snores a little. He is friendly with other dogs and gets along well with both of my dogs. When we meet dogs on our walks he is polite and interested but not overbearing. He pays no attention at all to my cats. He is not aggressive at all to people, although I have not seen him around children. At this time Bugle is not fully house trained, although he is improving, and he is crate trained. He rides well in the car, and usually just curls up and goes to sleep. Bugle is at least partially deaf and something of an escape artist. His new family should either be willing to supervise him outdoors at all times or have a secure fence that he cannot climb. He loves walks, and snuggling, and following me around the house. 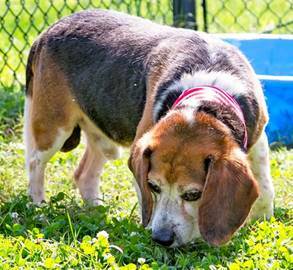 He is a good-natured dog that would make a good companion for someone looking for an older, quiet, yet still active dog.